January may be rapidly disappearing but has not completely left us as I write this. 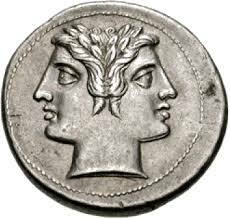 The month which starts our year is named after Janus, the two faced Roman god of beginnings and transitions. This is appropriate as the short cold days and long dark nights of this time of year are a good time look back at what has been and look forward to what is to come. We look back on the past year and give thanks for all the blessings it has contained and reflect on the harder times. We look forward to what is to come this year with excitement for the good things that are promised and a desire to not make the mistakes of years past. At St John’s, we are preparing for our annual meeting in April which provides us with opportunities for reflection and anticipation. We look back on what God has done in us, for us and through us in 2018 and give thanks. We reflect on the things we did wrong and repent. We recall the difficult times and try to see where God was with us in them. Then we look forward to who God is calling us to be and what he is calling us to do in this new year, both as individuals and as a church family. I wonder what you are giving thanks for. I wonder what you are excited about. I wonder what God has planned for us at St John’s. Whatever this year brings, I do know that we will have much to thank him for when we look back next January.